This was the most fun I've had at the movies in a LONG time. Once it starts it just never stops, and it is pure adrenaline and fun. And it's ridiculous, too, and the director knows it - there's an over-the-top fight scene where in the middle of all the action, "Don't Stop Me Now" by Queen starts playing and I just couldn't stop smiling. It's like the director is constantly winking at the audience, saying "Yeah, I know this is stupid and ridiculous ... but admit it, you're enjoying it, aren't you?" I've seen it called "Call of Duty: The Movie," because it literally looks like those games - you see Henry's arms and legs, and whatever weapons he's extending at the time. But it's precisely because it doesn't take itself too seriously that it works so well, whereas every cutscene in every Call of Duty game ever is one continuous eye-roll because it thinks it's Citizen Kane. 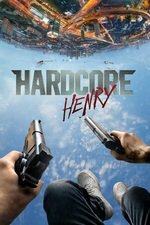 Couple of fun bits of trivia: The movie was filmed almost entirely with GoPro cameras, and evidently the two guys who play Henry are skilled parkour experts. So there are lots of moments when your gut will instinctively rise up into your chest. Seriously, if you have problems with motion sickness or vertigo, you need to take Dramamine before you see this movie. Also, the film pays homage to the classic 1943 film noir "Lady in the Lake," notable for being one of the few other films ever shot from the protagonist's point of view. At one scene, Henry breaks into an apartment and a poster for that film is on the wall in the background. I also loved it. The action would have been astonishing anyway, but Sharlto Copley's turn in a Peter Sellers-style multiple character role really took it over the top for me. I'm glad I wasn't the only one who thought of Peter Sellers. I decided I was going to see this movie when I read that the perspective issue forced them to rely almost completely on practical effects. Sold! The scene were the various avatars were singing...priceless. Just watched this tonight as it was first on my Must See Movies queue. Of course I loved it. It's one of those rare movies where you just don't know what's going to happen next except for lots of violence and blood. Even when they did subtitles of Russians talking over each other. Wow this was way way better than I thought it would be. I was afraid this movie would be really bad, because it sure sounds godawful when it's described. But it was not bad! I enjoyed reading Stephen Whitty's 0/5 review out loud in the most angry-prig voice possible. I also love Joe Morgenstern's quote, "A dim beacon in the darkening night of action features, signaling a path to plot-free oblivion." That seems like something you'd print out and frame. It's kind of interesting how polarizing this movie is. It's crass, but... it's not Crank, its not really setting out to shock and offend one's sensibilities. I suppose there are some people that it made motion-sick who can justifiably give it a 0. And there are people who imprinted on video game hissssss from the first ten minutes. But it seems like pretty essential viewing if you're going to claim to have ever appreciated an action movie. The obligatory threat the movie tacks on ... men programmed through video game violence and the promise of a hot gf, sent mindlessly to attack Washington DC and Paris, reads a little differently at this moment of history, I suppose.